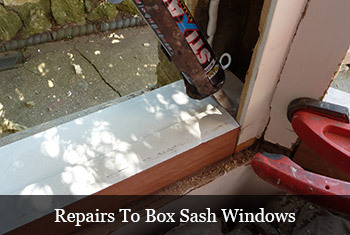 We also provide a sash window repair service. Where we will replace or repair various components within your box sash window where needed. These include complete sill replacements, front edge of sill replacements. Replacing outer linings and pulley styles. Sash components i.e. bottom rails meeting rails and general localised rot will be removed and made good with hardwood timber sections and/or “Repair care” resin. Please click on the link below for more information on this product. Sill replacements in particular when professionally undertaken can transform a tired, rotten window. In most cases there is no need to replace the box frame completely, when a box frame has been effected by rot. Rot inevitably develops in the lower sections of the window, where water settles. So by completely replacing these lower timber sections of your window. With purpose made hardwood timber sections. It gives you the best and most cost effective alternative to a complete window replacement. If you refer to the repairs gallery you will see that the sample window has had the existing rotten sill completely removed. In order to remove the existing sill, and install the new hardwood sill correctly and professionally. You need to remove the lower sections of pulley style and outer lining also. We cut the pulley style back to a point above the height of where the top sash will sit when in position. This way the point where new pulley style, adjoins existing pulley style will never be exposed to the outside elements. The opening is then prepared for the installation of the new hardwood sill. A polyurethane sealant is used to “Bed” the sill down, forming a seal between stonework and sill. New outer hardwood linings are cut to replace the existing linings that have been cut away. Once all the new timber components have been cut and dry assembled, all the new window components are bonded together using polyurethane sealants and glue to reform the lower half of the window. This method of sill replacement is the only method in which you can professionally replace an existing rotten window sill and make the repair a permanent one. We are in effect replacing the entire lower section of the existing window, with a purpose made hardwood equivalent. Also see our photo gallery for examples of window repairs. We also specialise in all period your joinery requirements. From shutters to skirting boards and architrave. All internal and external period joinery undertaken. See more examples in our photo gallery.